CRICKET: In their inaugural Phuket cricket season, the newly formed Goan Panthers upset the form book and expectations with a dramatic victory over league leaders Patong Blue in last Sunday’s (Sept 16) C&C Marine league semi-final play-off at the ACG to set them up with a place in next week’s Grand Final. 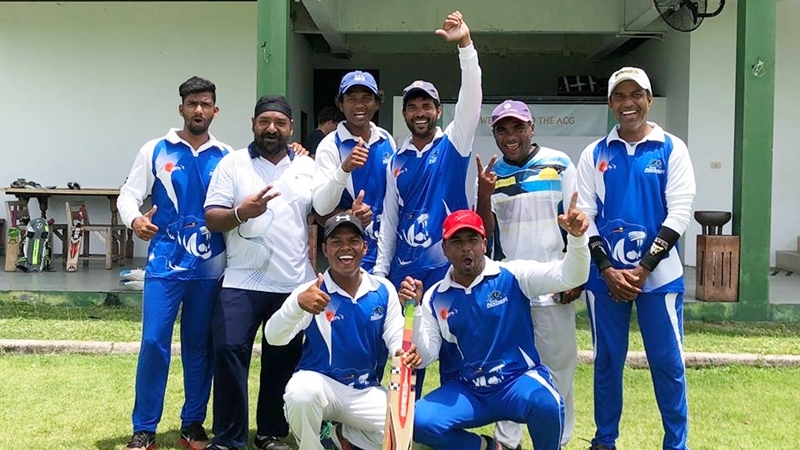 Despite fears of inclement weather, perfect conditions greeted the players on arrival for the first semi-final, which pitted Patong Blue, who finished top of the table, against fourth-placed Goan Panthers. Having claimed top spot for their consistent league performances and boasting two previous wins against the Panthers, Patong Blue would certainly have felt confident of progressing to the final, but without their batting talisman, Matthew Kohler and starting the match a player short, a clear cut victory was never on the cards. The Panthers, however, have seen steady improvement over the course of the season, and while their batting performances have been somewhat mixed, their bowling line-up has gathered respect among their opponents. Batting first, the Blues opened with Shad Wahid and Rishi Sadarangani in facing the formidable strike attack of Arun Viridkar and Ravi Naik, with Rishi taking the lead in the partnership by cracking two 6s off Naik in the second over, pushing the score to 18 before being dropped by Naik in the fourth over off Premkumar Salikinini’s bowling and the score reaching 29 for the Blues. Rishi’s (30) reprieve inspired two more boundaries from the Blue’s batsman before attempting to punish a short delivery from Virdikar, but his lofted effort succeeded only in finding the safe hands of Pranesh Kinlekar. And with his very next delivery, Virdikar found a way through Wahid’s defenses to flatten the stumps, with the score now on 40 for 2, subsequently giving Virdikar a chance of a hat-trick at the start of his next over. The swift loss of two wickets brought an all new partnership combining the intimidating Muhammad Ahmed and the technically correct Manish Sadarangani. A six from Ahmed’s first ball faced may have signaled a cause for concern from the Panthers, but both Naik and Salikinini steadied the ship with decent line and length to limit any further damage, before Naik struck again in the eighth over bowling Ahmed for an inexpensive 16 runs, bringing Roshan Jayasuriya to the middle and the score on 59 for 3. Vijay Salikinini took over the bowling responsibilities in the ninth over and with his third delivery caused the ball to swing back at Manish, who misread the movement allowing the ball to clip his off-stump, sending the bemused batsman back to the clubhouse. Concern was certainly circulating in the Blue’s batting camp as Sameer Khan joined Jayasuriya, with the league leaders now losing wickets at a rate of one per over... and Jayasuriya did not let the statistics down edging a Naik delivery to keeper Balesh Dessai in the 10th over, before Virdikar claimed Khan as his third wicket in the 11th over, with Premkumar taking a straight forward catch. Finally, it was left to Saju Abraham as last man standing to squeeze a few extra runs, but he too fell victim to the wicket per over stat, caught by Mayur Denskar in the 12th over off Vijay’s bowling, ending the blue’s innings on 72 all out. Targeting 73 to win, the Panthers opened with Naik and Denskar knowing that the loss of early wickets would give hope to the Blues in defending a particularly low total, while the Blues needed to ensure extras were kept to a minimum. Unfortunately for the Blues, bowling too many wides proved instrumental to their eventual downfall, leaking 23 runs through wayward deliveries, with extras in fact claiming top scorer for Goa. Given that the Panthers scored only 47 runs off the bat, and the highest individual score coming from Naik (19), the Blues will no doubt lament their weak showing with the bat and such a loose performance with the ball. As the Panther’s innings progressed to the sixth over without loss for 29 runs, achieving the target seemed only a matter of time, when a delivery from Khan caught Denskar LBW backing onto his wicket. Naik was also to fall to Khan’s accurate bowling in the same fashion four overs later, but the addition of several more wides helped drive the Panther’s score to 58 for 2, and only 15 runs needed for victory. It was at this point, with the finishing line in sight, the Panthers began to unravel, but they were fortunate to have Lucky Singh (12) anchor the innings as the remainder of his team came and went in quick succession giving the Blues real hope that they could miraculously steal a finals berth away from the stuttering Panthers. Virdikar was first to go with the score on 60 – caught by Khan off Ahmed’s bowling, followed two runs later by Kinlekar who edged a delivery from Manish to wicketkeeper Wahid behind the stumps. Manish then also claimed Dessai’s wicket given LBW by umpire JG de Swardt before Premkumar suffered the same fate, this time at the hands of Ahmed and the score on 69. The winning runs eventually came in the 15th over, sending the Panthers into celebration, but with an element of relief also evident in their reactions in taking an anxious two wicket victory. The Goan Panthers should also be commended on a decent sporting gesture in allowing Patong Blues to use Ike Bekker as a substitute fielder, ensuring the league leaders at least had a full complement of players for their fielding innings. Arun Virdikar topped the Panther’s bowling figures with 3 for 24 off his four overs, while Muhammed Ahmed was awarded Man-of-the-Match. Certainly, the day’s second semi-final, had the hall marks for another exciting match, with second placed Patong White taking on third place Kashmiri CC. Having also played each other twice in the league, Patong White had scraped a victory in their first encounter on June 24, but Kashmiri CC claimed their revenge with an emphatic win from their second meeting on August 12. Sadly, it was the rain that eventually won the day when after the eighth over both teams retreated to the clubhouse to escape a downpour that persisted for the afternoon, rendering the pitch unplayable and the match eventually being abandoned at 4:30pm. However, another fine sporting gesture ensued, when the rules were consulted to determine the next course of action, and it was deemed that Patong White was to progress to the final given that they had finished ahead of Kashmiri CC in terms of league position and that the match had completed the necessary amount of overs to constitute a game (eight overs) before being abandoned. Following a discussion of the situation with captains and match officials, Patong White captain, Anthony Van Blerk, offered to have the match rescheduled to next weekend in order to allow both teams a fair opportunity of reaching the final, knowing full well he was within his rights to claim the victory. And while concerns were raised at the official ruling being dismissed, it was agreed that the decision was ultimately reached with respect to the spirit of cricket and sport... an attitude and value that would serve and benefit many a sportsperson, both professional and amateur alike. As such, Patong White will play Kashmiri CC in their rescheduled semi-final at 10am on Sunday (Sept 23), with the winner facing Goan Panthers immediately afterwards at 2pm in the Grand Final. For more information on all at the ACG, please contact Jason Robertson via jason@acgphuket.com or visit our Facebook pages: Phuket Cricket Group or ACG Cricket and Sports Facility.